Join Simba Games, and over and above the R10'000 Welcome Bonus, also receive 20 Free Spins to try on a wide variety of fun games. 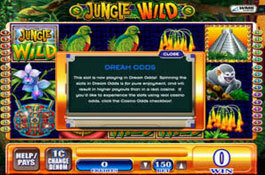 This slot is based on the lost Mayan civilization with hidden treasures in the Jungle. Follow the clues to discover the secrets that lead to precious treasures of untold wealth! 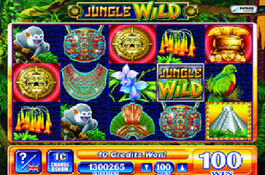 Jungle Wild is part of the WMS G+ Bonus Guarantee series of video slots which kicks in when winning less than 10 times the stake in the feature! 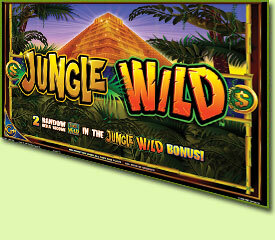 Jungle Wild focuses on the various insects, plants, and birds that can be found in the jungle as well as Pyramids and Gold. The Jungle Wild Logo is the Wild symbol which substitutes for all symbols apart from the Pyramid scatter. The unique Spinning Streak feature activates when a winning combination of 3 or more symbols appear on the reels. The remaining symbols will re-spin until no more winning combos appear. 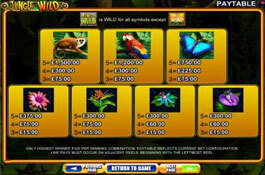 The Free Spins feature can be activated by landing 3 or more Pyramid symbols on the reels. 3 Pyramids = 5 Free Spins, 4 Pyramids = 7 Free Spins, 5 Pyramids = 20 Free Spins. During the Free Spins, 2 reels randomly become Wild with each spin. There is a Progressive Jackpot which will be awarded at random; this gives more chances to win big for the high-end players. The minimum bet is 0.30 coins and the highest bet is 90 coins. 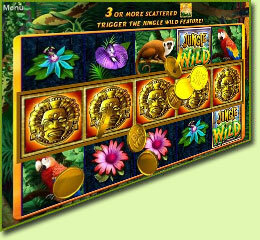 Win the standard Jackpot of 7 500 coins with 5 Jungle Wild Logos. This game is also popular for players with limited betting amounts.